Single visit onlays and crowns. Since Dr. Rader is able to design and fabrication the restoration immediately rather than sending an impression to a laboratory, you do not need to wear a temporary and return for a second appointment. Metal-free dentistry. Health minded people are increasingly becoming concerned with metal in the mouth (particularly mercury). A CEREC tooth restoration isn’t just convenient, it is also healthy. Many years ago, dentists had few options to repair decayed and damaged teeth other than amalgam, gold, and other metals. With CEREC, Dr. Rader uses strong, tooth colored ceramic materials to restore your teeth to their natural strength, beauty, and function. These materials closely match the composition of natural tooth structure. This means when you eat hot food and then drink something cold, the restoration and tooth expand and contract at almost equal rates. So, your tooth does not crack, and you can go on enjoying your evening. Also, the materials are chemically bonded to your tooth, so Dr. Rader can save as much healthy tooth tissue as possible while providing you with a dental restoration that strengthens your tooth. 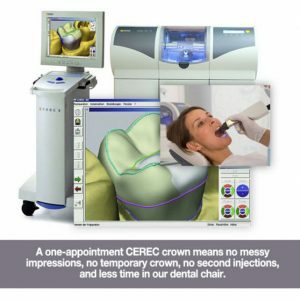 The CEREC enamel like material is biocompatible with the tissues in the mouth and provides a high-grade, anti-abrasive and plaque-resistant finish. In one visit with CAD/CAM dentistry, the mercury fillings were replaced and broken teeth restored with enamel hybrid ceramics.